Scott Rasmussen, a 1986 graduate of DePauw University, is the author of Politics Has Failed: America Will Not. Published by Sutherland Institute, the book "provides a much-needed message of hope to counter the nation’s dysfunctional and toxic political discord," according to a synopsis. "Scott Rasmussen's journey from pessimism to optimism provides a roadmap for all who want to get involved and seriously address the challenges facing our nation," it continues. "After observing, measuring and monitoring our nation’s political system for more than two decades, Rasmussen came to recognize it is broken beyond repair. Despite the failures of our political system, though, he remains convinced that America's best days are still to come. The opportunities enjoyed by our children and grandchildren will be far greater than anything we can imagine." "Just when you think everything has been thought and everything has been tried when it comes to creating forces for positive change in society, along comes Scott Rasmussen with some of the freshest, most inspiring thinking I've read in years," says Mark McKinnon, producer of Showtime's The Circus: The Greatest Political Show on Earth. "If you're worried about the future or depressed about the outlook for our country, you need to read Politics Has Failed: America Has Not. There is a light in the tunnel, and Rasmussen has found it." Jonathan Rauch, a senior fellow at Brookings Institution, adds, "Too many Americans suffer from GOD, government obsessive disorder: we blame politics for either causing our problems or failing to solve them. 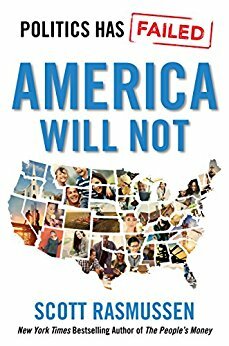 In this optimistic, open-hearted book, Scott Rasmussen delivers a spirited and timely reminder that civic groups, innovative businesses, and personal networks are where the real action will be in the 21st century -- and that their potential to improve our lives and our country is vast." Order the book here or at Amazon.com. Rasmussen previously authored The People's Money, Mad as Hell: How the Tea Party Movement is Fundamentally Remaking Our Two-Party System, In Search of Self-Governance and Solving the Budget Crisis: Hope for America's Future. 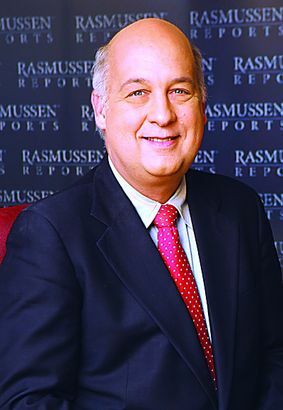 He founded the polling firm Rasmussen Reports and co-founded ESPN with his father, 1954 DePauw graduate Bill Rasmussen. A history major at DePauw, Scott Rasmussen went on to earn an M.B.A. from Wake Forest University.